Big Data and Analytics are the success stories of today. By Capture, Curation and Exhibition of relevant Data, Big Data is empowering enterprises with deeper and more meaningful insights into their data. Big Data is now the major focus across diverse industries and domains. Automobile industry faces new challenges in the market today. Improvements in technology, new entrants, shift to mobility as a service and change in customer preferences for more connected capabilities are some of the major challenges that the auto industry faces. To remain competitive, it becomes important for the auto industry to leverage the power of Big Data & Analytics. The data collected from automobiles can be simple sensor based techniques to record and monitor performance, maintenance and behavior of critical automobile systems, or more sophisticated GPS and satellite based techniques such as tracking vehicle position and recording external conditions. 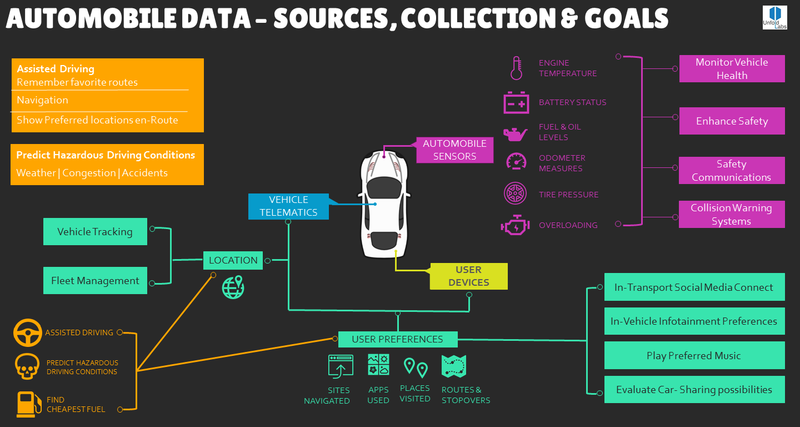 Data collection techniques for automobiles gained maturity over the years by using current technology offerings like mobile devices, wearables, Big Data, Business Intelligence, Cloud and Social Media. The major focus of these collection techniques was to improve customer experience and achieve better vehicle health. An automobile with internet and Wi-Fi access helps the user to be connected on the go and becomes a smart vehicle that offers assisted/autonomous driving, safety alerts, notifications about its surroundings and keeps track of vehicle health. Technologies like Android Auto, Car Play by Apple and Windows Embedded Automotive 7 that help keep cars connected are generating a lot of interest. It is estimated that by 2020, 90% of new cars will have connectivity setup, making Big Data & Analytics a crucial piece of technology that auto OEMs cannot afford to miss. 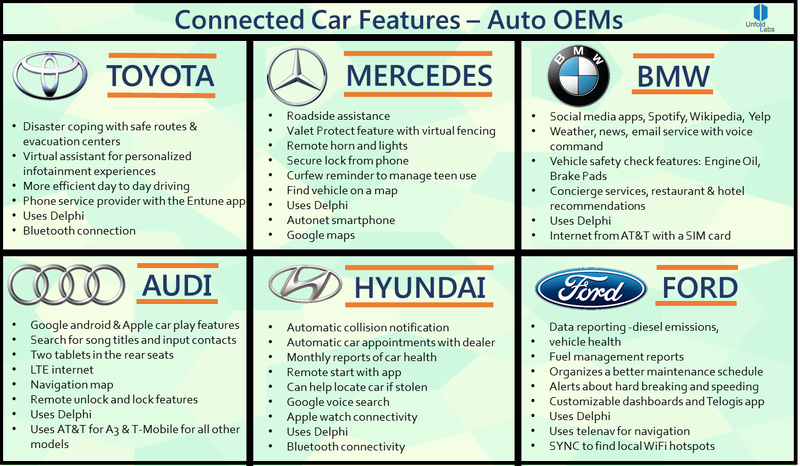 The features that OEMs offer for connected cars prove that it is in fact Big Data & Analytics that is all set to spearhead a technology revolution in the Automobile Industry. Auto manufacturers now use data related to real world driving experiences across their customer segments, the usage preferences and service analysis to understand the gaps in basic parameters like safety, fuel efficiency, battery life and other factors governing the overall performance. The insights gathered is being used to design automobiles that are safe and personalized to customer preferences. Manufacturing simulations are helping with continual improvement cycles, with the cohesion of Predictive Analytics and Big Data. Assembly line observations can help improve workforce and operational efficiency. Big Data helps make the Design & Manufacturing process more informed and helps deliver better transportation systems. This could easily be the most intelligent use case of Big Data for automotive industry — using Predictive Analytics to foresee problems in vehicle parts to prompt timely actions and ensuring better vehicle health. A logical prognosis also pre-empts any trouble with the automobile and service schedules are timely and automated. Most Auto OEM’s are starting to provide SAAS models where they are charging consumers with better solutions with data captured. With Big Data, companies specializing in auto finance are analyzing data pertaining to customer financial history and preferences. By combining this analysis with demographics & geography, organizations have launched ideal financing schemes best suited to customer requirements — leading to increase in business and ensuring safety from likely defaulters. Auto Manufacturers also are comparing costs, reliability & quality of different components within their supply chain to decide the best fit for their automobiles using Big Data & Analytics. Big Data is also being used in predicting demand thereby helping streamline the procurement process and making it effective and cost-efficient. Vehicle marketing becomes more meaningful when data collected is used for sentiment analysis and market segmentation. This also helps in campaign management and other vehicle marketing tactics. Facts and figures curated using Big Data gives insights to dealers and other partners enabling them to strategize and boost sales. Personalized marketing is the newest jargon in digital marketing. Customer profiles assembled using insights gained using Big Data help in integrating personalization into the software systems and enterprise solutions to arrive at better lead conversion rates. The automotive industry has been constantly driving adoption of next generation technologies. The advent and popularity of innovative car manufacturer Tesla caught the traditional OEMs by surprise — and most OEMs are now beginning to change their business models across the automobile ecosystem. Major changes and innovations can be expected in the next few years as the automobile and technology industries collide in a larger way. 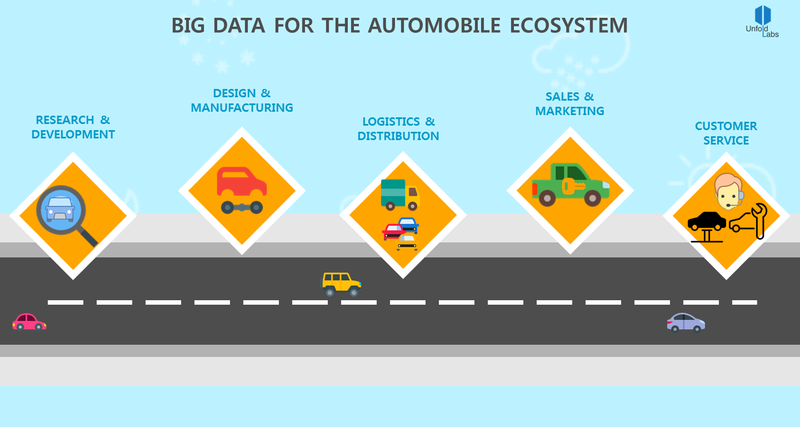 Big Data is already making a huge impact towards improving customer experience for Auto OEMs. In light of this success, Auto OEMs are moving faster towards Predictive Analytics, Personalization and Artificial Intelligence which in turn is driving the connected, driverless car market. However, discussions pertaining to Security (data/personal) are still elusive as Big Data adoption is in its infancy. The automobile industry is beginning to expanding its boundaries from traditional notions to innovative concepts such as Electric, Connected & Autonomous vehicles and Mobility Services using Big Data and advances in technology. To tap into the innovation happening now, most OEMs already have a presence in the Silicon Valley and we expect a lot of features to get integrated into the next generation of cars in a larger way and in a shorter time to market. Big Data is for sure going to be a big game changer for the road in the near future. Previous article “Alexa, book me a hotel” is technology killing the travel agency?